Suffolk Jewelers and Pawnbrokers opened at the corner of Washington Street and Newcomb Street in Boston’s historic South End district in 1910. It is the oldest pawnshop in the Commonwealth of Massachusetts, and the largest store of its kind in New England. It is located along the thriving commercial and residential strip of Washington Street. 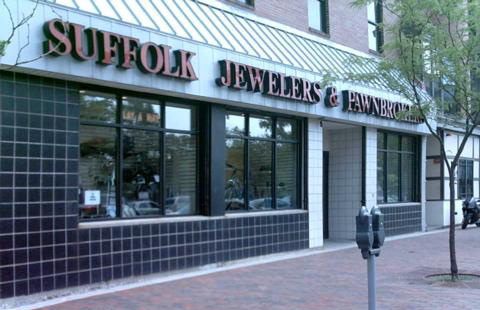 It was originally named Suffolk Loan Company, and changed its name to Suffolk Jewelers and Pawnbrokers in 1986. Suffolk has been a mainstay of Boston’s South End since its opening. The store has served customers through both World Wars, as well as during the neighborhood’s many transitions, including the economic downturn of the 1960s and 1970s, the removal of the famous elevated train tracks along Washington Street in 1987, and the neighborhood’s recent resurgence as a popular restaurant and shopping district. Throughout the transitions, Suffolk has remained an anchor on Washington Street. Generations of families have continued to return to the store, drawn by its reputation and support of the community. Suffolk provides funding and other support to the local summer basketball league, several area churches, and numerous nonprofit organizations. Saturday: OPEN ONLY on the 1st Saturday of each month.